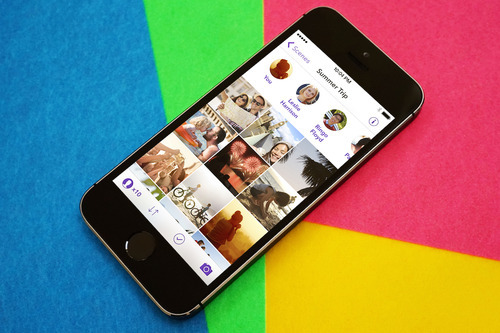 A new mobile application launching today called Seahorse lets you create collaborative photo and video albums with friends and family, as well as ways to filter your past photos by time, place, or those you were with. The app, a fairly robust alternative to your smartphone’s default photo gallery, lets anyone add photos or videos to a shared “scene,” as these collaborative albums are called. But what makes Seahorse different is how it treats those photos and videos after they’re shared. For up to a week, anyone can delete photos from a “scene” – no matter who added them. The concept the company is trying to get across is something called “co-ownership” of photos. That is, it’s trying to take away the importance of who shot the photos, and give control over what becomes permanently archived to all those who were a part of a shared album – the people who were likely the subjects of the photos or videos in the first place. This is Seahorse’s main selling point, as its other features are a bit of a mish-mash of things we’ve seen before in competing photo apps, including the default experience in Apple’s (forthcoming) iOS 8 Photo app which offers smart search by date, location and album name, for instance, which is similar to Seahorse’s ability to filter by “scene,” year, or country. Meanwhile, Seahorse offers another photo “discovery” feature that’s inspired by other apps currently on the market. Called “Flashback,” the feature brings back photos from today’s date in previous years, similar to Timehop or Memoir, for instance. The app, in fact, is approaching the same challenge Memoir wanted to solve, but from a different angle. It, too, wants to find a technical solution to the problem of not having access to photos your friends took, but never shared with you. But where Memoir prompts you to ask friends to share, Seahorse has you more traditionally creating collaborative albums that you invite others to join, which puts it also up against other collaborative photo album builders, like Cluster, for example. Explains co-founder Oskar Hjertonsson, who comes across as a bit obsessed over people’s photo-sharing experiences in general, the goal with “scenes” is not to serve as a temporary space to collect photos, but a way to build albums meant to last. In addition, Seahorse offers some fun tricks, like shaking your photo for “random” memories, or the ability to view your photos on a map. Its Timeline view is also handy as way to filter through a larger gallery. And it offers a decently sized feature set for any photo gallery companion, including support for original resolutions (on Wi-Fi only), a Camera Sync function, an Importer for pulling in photos from other services, like Dropbox and Facebook, the ability to copy photos between “scenes” and more. The service is also available online, and desktop apps are the works. But for Seahorse to really work, it has to find a way to convince users that it’s a big step up from the built-in photo gallery, and that has proven a tough challenge for many startups before it. Plus, collaborative photo apps often face another obstacle, as well: the fact that among photo-takers there are those who simply care more about photo-sharing or gaining access to others’ photos, and are willing to actually do something about it. Call it the 1% rule, but most people are inactive lurkers, not participants. They might join a shared album and view the content (maybe), but it takes more work to get them to actually share. And finally, because it does so much, it’s a bit hard to actually quickly explain to a new user why they should switch to Seahorse. Some might like that it can import photos from all their services, while others will like the collaborative albums, and others still will be drawn to its search and filtering functions – you’re never quite sure what point will sell them. The largely bootstrapped, San Francisco-based startup is co-founded by Hjertonsson and Daniel Undurraga, who both previously launched social marketplace Needish, and later a daily deal site for Latin America, ClanDescuento, which was acquired by Groupon. Seahorse has been in public pilot testing with 10,000 users before its “official” 1.0 debut today. These users have been uploading around 1 million photos monthly, says Hjertonsson. The app is a free download on iTunes and Google Play and comes with a limited amount of free storage you can increase by performing tasks like inviting friends. An upgrade to a Premium account with 100 GB of storage is currently $9.99/year available via an in-app purchase.